Our Abpromise guarantee covers the use of ab28401 in the following tested applications. Tuberoinfundibular peptide of 39 residues (TIP39) was initially identified as a neurotransmitter and agonist of the PTH2 receptor, which is expressed in the cardiovascular system. Accumulating evidence suggests that TIP39 may be the endogenous ligand of the parathyroid hormone 2 receptor. The vast majority of TIP39 containing neurons are localized in two regions, the subparafascicular area at the thalamic midbrain junction, and the medial paralemniscal nucleus in the rostral pons. 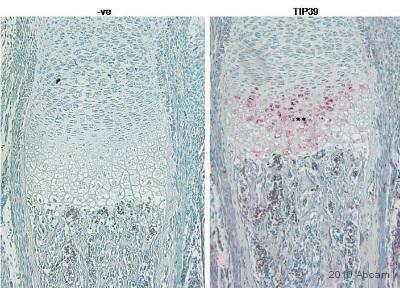 In contrast to the restricted localization of TIP39 containing cell bodies, TIP39 containing fibers have a widespread distribution. Publishing research using ab28401? Please let us know so that we can cite the reference in this datasheet.